Keeping in line with the warm weather thought pattern, and One Step Ahead's solutions theme, I've got another great idea (and giveaway) for how you can keep the kids busy this year, and having fun, right in their own backyard!! If you're looking for excellent and unusual playtime solutions, One Step Ahead is always the place to go shopping! 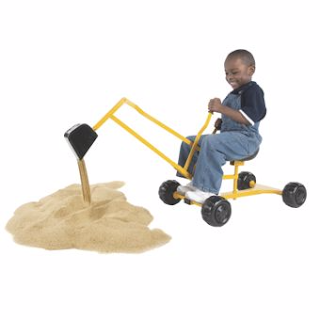 This Sand Digger Scoop N' Swivel Backhoe Sand Toy has easy operation because it's intentionally made of ligher material than traditional toys of the same vein. Put the kiddos to work helping in the yard (Can anyone hear someone from their childhood saying, "Make yourself useful?" lol), or just let them scoop, dig and move for fun. My second oldest used to spend such a long time playing with this type of toy at an amusement park we used to visitt. He loved it more than the rides they had, ha! I can just imagine how thrilled he would have been to have one of his very own. This would make an amazing gift for someone special too! What child wouldn't love to get one of these for a birthday gift? It's easy to assemble and would add instant life to any party too. This toy isn't just for boys either...I'm positive little girls would get a big kick out of playing on this sand digger too. Once again, One Step Ahead is leading the competition for fun ways to keep our children entertained. This toy is for ages 2+ and holds 70 lbs. You can learn more about One Step Ahead product by visiting their website. I remember my boys playing on a similar toy at the playground sandbox. Boys do love to dig. This is another great giveaway! I like the Height Adjustable 2-in-1 Table and Chairs Collection. Geez, I only had small ones to dig with as a kid, how rude lol bet that's a lot of fun. I also like the Sun Smarties Double Adirondacks. I love the Mesh 8 Panel Play Yard. So many wonderful items to choose from! I also like the Hide away Rails for little ones' beds! My cousin has a little granddaughter who could probably use those! Wow you could win an entire playground for kids right here on your blog! How cool is that! I learned they have several equipment pieces for kids. 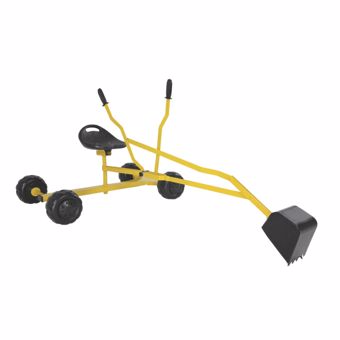 I learned this the arm swivels 180° in both directions and it can hold a child up to 70 pounds. this is so good because so many toys are built with the notion that kids are tiny and petite and small in weight which in kids today, they seem to be a little heavier even when they are completely in the scale for size. I've purchased from them many times and been very happy with the service and quality I've received. I have to hide the catalog from the kids, they want everything in it. That is SO COOL! OMG, my little guy would LOVE that. This was always the favorite toy at the park. My boys would play in the sand for a long time. I don't have children but the sand digger would be fun for my niece and nephew! I like the Sun Smarties Wood Sandbox with Canopy. It would be perfect for the backyard! That's cute! I would love one of these. This is so neat! I have never seen anything like this. I saw one of these at the beach last summer and was totally tempted to go sit on it and dig myself. Where were toys like this when I was little? This is a great way to keep the kids active during the summer. Love the idea of it being a bike as well. Awesome! My grandson would be thrilled to have the Sand Digger in his back yard. I like the Kids Ride-On Tractor with Trailer. Thanks. haha what will they come up with next? really cool. heck I would ride that thing if they made one for adults. I like the ball drop mega maze! I learned that they have a huge variety of items and they have some really great clothing items too. I really love the Sun Smarties Sun hats, they're so darn cute. That is one awesome toy! I remember when I was feelin' like one of the boys before, I would always wish for something that simulated crane trucks. This is one handy gift for kids! This is great! love it. Good luck to all giveaway entrants. These are so neat! I remember seeing one at a playground once. The kids love them! That is an amazing toy! my nephew will love it! I love how fun that toy would be when kids play it. I like the aqueduck handle extender. It really helps to teach kids independence! My kids love the digger at the parks. They could easily spend hours playing on them. I like the 70 Inch Indoor Retractable Baby Gate. This is amazing! I like the personalized one :) Good luck everyone! My son plays with this at the local museum and absolutely loves it. This would be a neat addition to the backyard! I like the 2 in 1 Tricycle Scooter. I also like the My Step Up Stool. I love the Configuration Balance Beam. I like the Dinosaur Rocker--definitely a change from a rocking horse! I like their section "Shop By Hurdles"
I like the Aqueduck Faucet Extender 2-Pack. One Steps has products for Clothing & Accessories, Feeding, Health & Safety, Home & Organization, Pre & Post Natal, Seasonal & Gifts, Toys and Travel. Great Company! I liked the Aqueduck Handle Extender! My youngest would really benefit from this, in fact, it's something the whole family could use it! I love the large selection of products that they sell! The My Closet Organizer System would be so helpful! I like the Toddler Kore ™ Wobble Chair. I like the Pop Up Play Tent & Tunnel Town. I like the sili squeeze reusable baby food pouch. I would love to get the Sun Smarties Double Adirondacks. I love the Fun & Fitness Weight Bench for Kids. So darn cute! I like the Spiro Hop Teeter-totter Seesaw. the personalized step stool I love !! I like how there are so many items that can be personalized. I have twin nephews and i think the double adirondack chairs would be adorable for them. I like the My Geo Gym Play Forms is great. I like the beach cabana for the family. That would protect my fair skinned 2 year old from the harsh sun. I love the Pop 'N Play Canopy. This year I am all about sun protection with our active outdoor family. I love the My Closet Organizer System! !